The last recorded words of the ill-fated crew of an Irish Coast Guard helicopter which crashed in the Atlantic were "we're gone". Air accident investigators have revealed one of the winchmen on Rescue 116, which went down off Co Mayo at 12.46am on March 14, alerted the pilots to an island as they returned to shore to refuel. And the inquiry has also established that the Sikorksy S-92' s internal warning system did not include the rocky Atlantic outcrop and its working lighthouse in its database. The search and rescue helicopter crashed after hitting Blackrock Island while coming back from supporting a mission for an injured trawlerman. On board were Captain Dara Fitzpatrick, the commander of the flight who was pulled from the sea in the hours after the crash, and Captain Mark Duffy, the co-pilot whose body was taken from the cockpit 12 days later by Navy divers working at depths of 40 metres. The bodies of winchmen Paul Ormsby and Ciaran Smith have not been found despite weeks of intensive seabed, surface and shore searches. Ireland's Air Accident Investigation Unit (AAIU) released its preliminary report on the crash which stated that the helicopter's Honeywell Enhanced Ground Proximity Warning System (EGPWS), which alerts pilots to imminent danger from terrain and obstacles, does not include either the terrain of Blackrock island or the lighthouse on the island. The AAIU said: " The investigation is continuing to engage with Honeywell and other parties/agencies to reach a full understanding of this issue." The EGPWS is designed to assist the pilots and reduce the risk of controlled flight into terrain and it offers both visual and aural alerts when there is a risk of a crash. The manufacturer told the AAIU that it had looked at two alternative sources for terrain data and while they mark Blackrock the company said that the actual altitude of the island is "considerably higher". The AAIU called for CHC Ireland, which operates the Irish Coast Guard search and rescue helicopters, to review and re-evaluate a ll route guides used in the aircraft. It said this should be done with a view to enhancing the information provided on obstacle heights and positions, terrain clearance, vertical profile, the positions of waypoints in relation to obstacles and EGPWS database terrain and obstacle limitations. The investigation found Rescue 116 pitched up rapidly in the final seconds of the flight before it hit the western end of Blackrock and "departed from controlled flight". The wreckage of the helicopter was found on the seabed about 60 metres off Blackrock after search teams homed in on beacons. While investigations continue into the warning systems on board the helicopter, the AAIU released extracts from the cockpit voice recorder, including 1.40 minutes immediately before the crash. It revealed that the aircraft's Radio Altimeter gave a call-out of "altitude, altitude" 26 seconds before the helicopter struck Blackrock. The recordings show Captain Fitzpatrick said there was "just a small little island" below the helicopter. Other data shows Rescue 116 was near an outcrops of rocks, Carrickduff and Carrickad, about 0.65 nautical miles to the west of the Blackrock at the time. About 10 seconds later one of the winch team, who the AAIU suggested was using a high definition electro-optic and infrared camera, told the pilots he could see an island directly ahead and urged Captain Fitzpatrick to "come right". She confirmed the advice and the winchman replied: "20 degrees right yeah". The black box flight recorder showed the helicopter heading was changed but the winchman interjected with increasing urgency and called: "Come right now come right COME RIGHT". The AAIU report said the co-pilot Captain Duffy swore twice and his words of "we're gone" were the last to be recorded. It said the cockpit voice recorder has no reference by the crew to the presence of a lighthouse or terrain at Blackrock during their briefing for the approach to Blacksod where they were due to refuel. 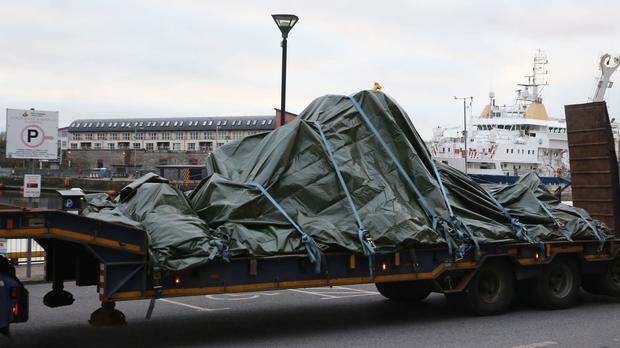 Investigators said the helicopter was travelling at about 75 knots prior to the crash and it appeared to be in a nose high attitude when it hit Blackrock. It said that following the initial impact, the data indicates that the helicopter climbed while experiencing large changes in pitch, roll and yaw angles. By Cate McCurry, Press Association The government has pledged an extra 1.5m euro in funding to tackle a rise in domestic and sexual violence. By Cate McCurry, Press Association A man has been shot during an incident in Co Louth. By Aoife Moore, Press Association Tributes have been paid to Superquinn founder and former senator Feargal Quinn, who has died aged 82.